To all you Avatar fans who wanted to kill yourselves because Pandora wasn't real, don't slit your wrists just yet. Director James Cameron is coming to the rescue. He's in the planning stages with Disney to create a motion ride similar to "Soarin' Over California." Instead of flying over San Francisco, riders will get to fly through the skies of Pandora. Sounds pretty cool. Cameron doesn't mention if you'll get to ride a Banshee or if you'll get a hair-braid to plug into it, but here's his summary. “I definitely want to do a flight attraction of some kind. Flying is a big part of the movie. One of the things people liked the most at test screenings was going up into the floating mountains in the flying sequences. We may have banshees, Leonopteryxes, maybe some other flying creatures that don’t make their appearance until the second and third films. It all needs to be one fabric. As long as it’s thematically consistent, as long as it looks and feels and smells the way you imagine it, then we’ve succeeded." That all sounds good, but raises an important question - what does Neytiri smell like? That actually made me think for quite a while. In my fantasies, Neytiri smells like strawberries. But considering the Na'vi live in a rain forest and are covered in fur*, I'm guessing wet dog. Well, thanks to James Cameron, we'll soon find out. * Yeah, forgot the Na'vi are hairless except for the braid. Are you looking forward to flying through Pandora? What do you think Neytiri smells like? Seriously. Leave your thoughts in the comments. 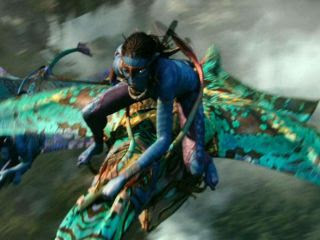 Maybe Neytiri smells of Eucalyptus leaves or perhaps Hometree a red cedar?